I’m in the lucky position of being able to pop to a sleepy french town every so often. My mum and stepdad have decided England is too cold/expensive and want to retire in France. They’ve bought a lovely little house and are renovating it so they can spend their golden years gardening and drinking wine for breakfast. While the crafting/sewing boom is awaking, sewing magazines have been springing up all over. 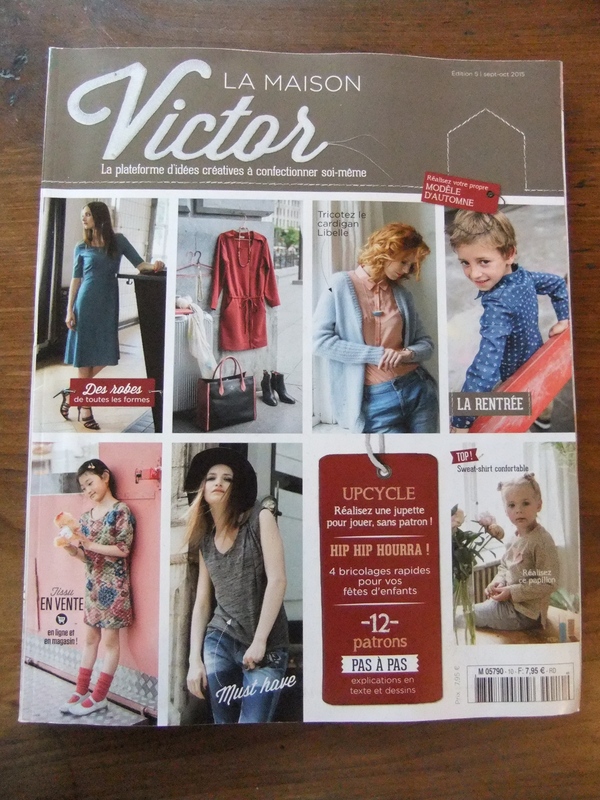 I’ve taken the chance to stock up on French sewing magazines (even though I don’t speak a word of the language) and thought someone would maybe be interested in what they have to offer their home sewers. Now, starting from my favourite! I’ve only got two issues but I’m going to start getting them regularly. I love how contemprary this magazine is and there is literally a project for every member of the family, so no selfish sewing excuses!! How adorable is this dress! Sent me off on a broody spell. I’ve never been interested in sewing for children but this dress turned me. Every pattern is very chic and beautifully styled. 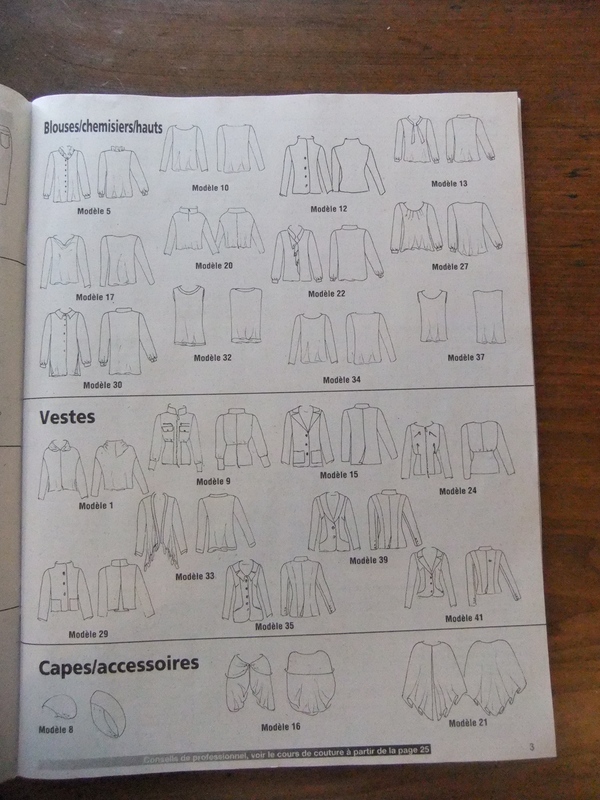 I don’t speak French but that is not an issue because the step by step pictured instructions to sewing each garment is fantastic!!! They lead you through everything. It’s brilliantly done. I need to sew up this coat for Spring next year! The hype about this magazine are definitely well founded. My other favourite but less talked about magazine is Couture Mode. It only has patterns for women and they are gorgeous. There are not as many patterns as Burdastyle but the tracing is much easier. This magazine also has fantastic instructions. They even include pictures of sewing needle to show you even more clearly that this is where you sew, I love it! No need for google translator. 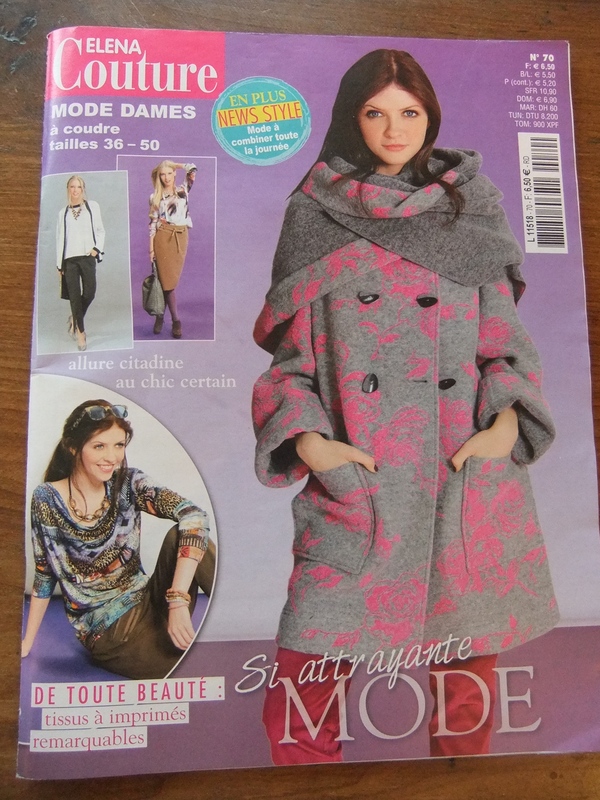 The magazine is very modern and all the patterns are lovely, a few are on my very long sewing list. Now I have an overlocker I can finally make this dress!! It is such a staple and for some reason I love the turtleneck, they used to bother me before but I’m dreaming of some soft Bamboo Stretch Knit on my neck keeping me warm. Another magazine I sometimes like to buy is Elena Couture. 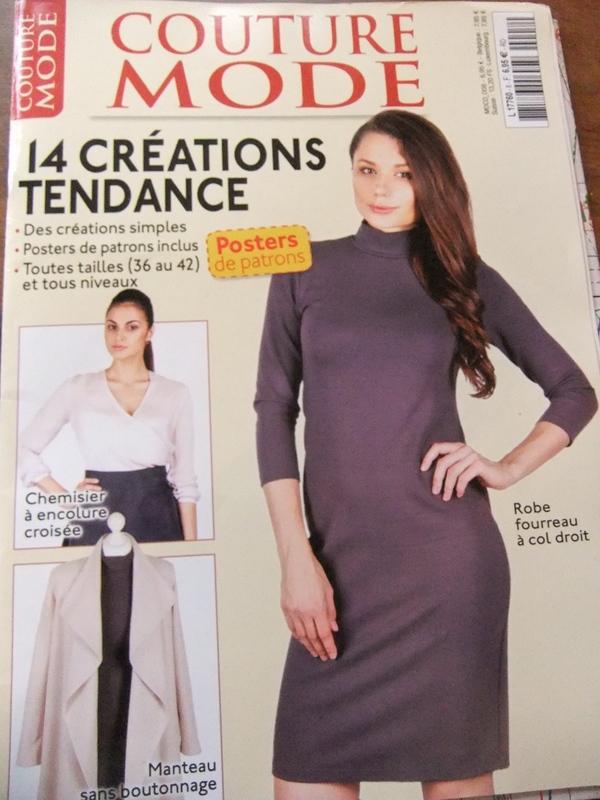 It definitely has an older feel to it and is one of the French sewing magazines that doesn’t seem so targeted towards trends. This magazine has a slightly Burdastyle feel to it. There are loads of patterns, lots of confusing tracing to do and questionable styling choices. But like Burdastyle they do have some nice pattern options (I particularly like the dress below) it just takes a bit more vision on your part. Nothing that screams MAKE ME IMMEDIATELY!! but nice bits that I know will get made when I find the right fabric or want to stash bust. This dress kinda reminds me of the Pauline Alice Xerea dress, which I was so on the fence about buying. So don’t be put off by the cover! Have a look and you might find something you love. If you have any friends/relatives travelling to France these would be the magazines I would ask them to bring back for me. 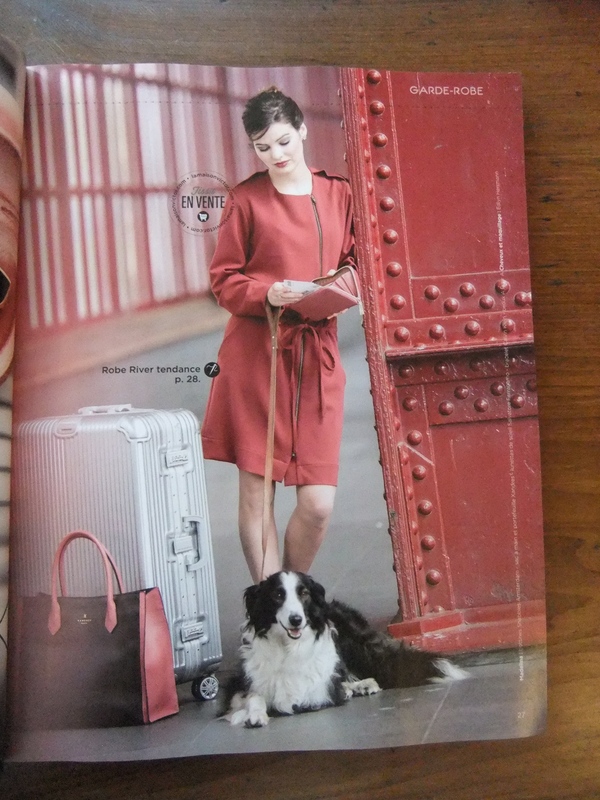 What I love about French sewing magazines is they give me exactly what I want. Loads of patterns and a fairly detailed sewing process. They know there is a massive clothes making community and we want patterns!!!! that are wearable and interesting! I still feel really envious of other European sewing magazines, from what I’ve seen/heard their magazines are filled with loads of gorgeous patterns. Finland is supposed to have some of the best sewing magazines. One which Named Clothing does all the patterns for!! How about other countries?? America, Australia, New Zealand…I’m really curious, what are your sewing magazines like? I think I like the last magazine the best! I tend to look past the styling and concentrate on the shape of the garment and, as I’ve never been trendy, the ‘more fashionable’ ones don’t appeal to me anyway. I subscribe to ‘Love Sewing’ but not sure if I’ll renew when it runs out. You’re right, we don’t have great sewing mags over here. I’m definitely a magpie and almost put the last one back but I’m so glad I kept it. It has some real gems! Oh no! I put all my hopes on Love Sewing :,( I might just stick with Burda. I really like the look of La Maison Victor – I thought it was Dutch though! I emailed them to see if they would be able to mail to the UK and they provided me a quote for the subscription and it works out to be about £50 for the year INCLUDING postage! If you like the French version they’ll probably post that too! I sewn the grey coat of La Maison Victor in a blue heavy cotton with a green dotted underlining! it was fantastic! the only thing pay attention to dimension because they are a little bit to big, and to the sleeves, I personally made them a little big longer. The overall pattern is great! Oh wow!! Did you do a blog post? I looked but couldn’t find it. It sounds amazing and would love to see it! Not yet! But I sure will! It’s so classy! I never buy sewing magazines and only recently bought a sewoverit pattern because I liked the look of it and I was curious. It was expensive, but I’ll get my money’s worth by hacking it! But when I’m looking at lots of different blogs I thought everyone had a big choiceof patterns to make from? Is this not the case then?? ooh which sewoverit pattern? I’ve got 3 of them but have never tried a hack on any. I have the Sewoverit vintage shirt dress. I don’t wear dresses but thought it would be good as a jacket, and it is. I made another jacket from it using two contrasting fabrics these two are on my blog. I’m hacking it again just now to eliminate the waist seam. It’s a very easy one to make up! Thanks for all the info! When I used to go to France often I always made time to go and drool over the sewing magazines and books, they have such a big variety and the styling always made me want to buy them all. Germany has a good collection of sewing magazines and books too. And yes I agree, with the exception of Love Sewing, I don’t buy any other sewing magazines in the UK. Burda is a love hate relationship haha! haha I completely understand what you mean about Burda! When I was in Poland is was £2 so I was more forgiving and bought it religiously but now I just can’t understand some of their choices!! and only get it every now and again. That was interesting, now I’m so curious about other countries too! Do you get any free gifts with the French ones? How does the price compare? You’re right on the advertising front in this country! I think free gift are not given and looking at subscriptions they usually don’t offer a subscription gift either. The price is the same so it’s usually about 6 Euros which I think is really good for the patterns provided. There’s no readers letters or questions answered which I do miss but thankfully no massive chunks of advertisement!! Threads, which is the most widely available American sewing magazine, sometimes has simple patterns, but is mostly devoted to teaching techniques. I enjoy reading it, even though the styling is a little crafty looking as reads as a little early 90’s to me. I LOVE patterns by Deer and Doe, which is a French indie pattern company. Their directions come in French and English. I have seen Threads in the UK but I think I judged it too harshly because of the styling! I will definitely have another look through it if I see it again. 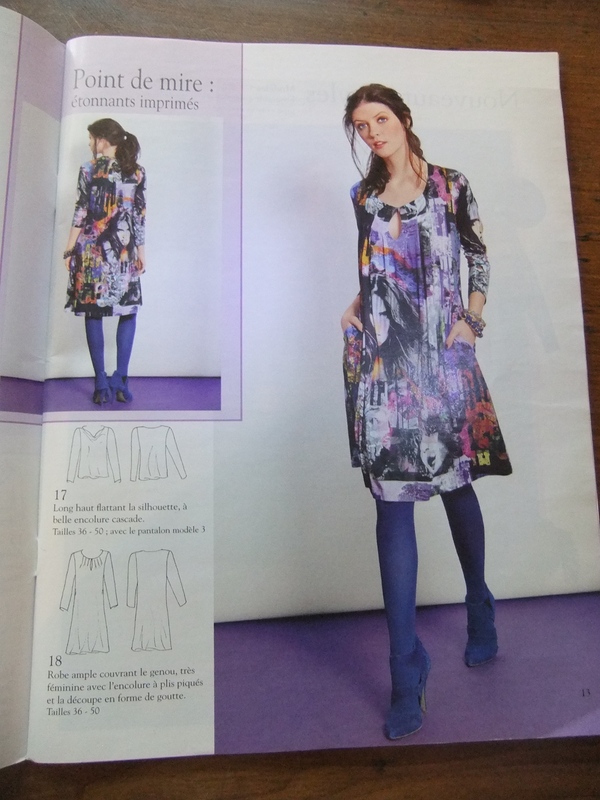 I have a couple of issues of Ottobre – they do a kids magazine (Which is choc full of stuff) and a womens one and they just have garments and patterns in, no advertising. You do have to trace but it’s colour coded and not so bad, however the instructions tend to have no diagrams at all, eep. Hi, I am fluent in French. I can help you with the instructions if you’re stuck! thank you!! I’m definitely going to come to you for help! Sorry Meg, I had not seen your question before now. I’m new at blogging! Unfortunately, I do not know Paris. Hopefully, you’ll find what you are looking for! oooh sorry just read you’re in Canada!